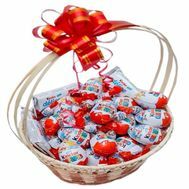 Basket with sweets Kinder - this is an excellent gift for lovers of sweet, a present from a distant and bright childhood. 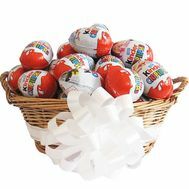 Every person, big or small, dreams to receive a gift basket of candies Kinder Surprise. 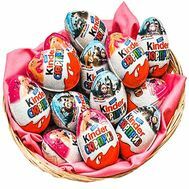 After all, we all remember the divine taste of this chocolate, which is melting in the language. 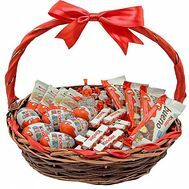 Basket with chocolate Kinder will suit as a surprise for the beloved, as well as for children, very young and adults, because in each of us there lives a child who loves sweets. 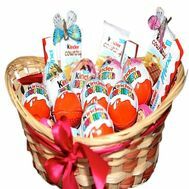 In addition, it is an original birthday present - small chocolate eggs, inside of which - various surprises that increase mood and cause a smile. 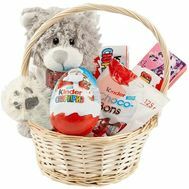 Baskets with eggs Kinder Surprise - romantic, childishly attractive, and just cute gifts for all occasions! 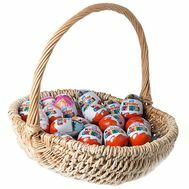 In our store, which has more than 10 years of experience, it is always profitable and easy to buy. Especially considering our promotions and various discounts for customers. 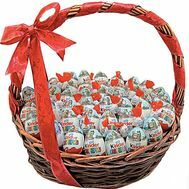 You can always read the reviews and see the photos of the deliveries, making sure of the quality of our work! 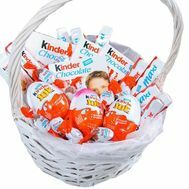 Buy a basket with Kinder, and our courier will bring it at the exact time and at the right address!